I’m about to get myself into a whole lot of trouble with what I’m about to say, but I’m prepared to roll with the punches. The LDS market has had its ups and downs. Some fabulous books have been published, and some not-so-fabulous books have been published. That, my dear bloggy friends, is a problem. The LDS market is very small still. We need to be holding ourselves to a higher standard so that when people hear the words “LDS fiction,” they aren’t immediately fighting a gag reflex. 1. Predictable plots – girl meets guy, one or the other of them isn’t a member, so they join, and they live happily ever after. 5. Too froo-froo – the books don’t address real-life issues. 6. Problems are solved too coincidentally. Today’s readers want meat. They want to sink their teeth into a story, not nibble around the edges of the frosting. This is not to say that they don’t want entertainment – they do. But they want intelligent entertainment. As I see the potential the LDS market has, I get all excited to think about the amazing books we can turn out in the future. We have already done a lot to increase the quality of what’s available. I mentioned in today’s earlier blog that LDS authors are researching more thoroughly, editing more meticulously, and stretching themselves farther than ever before. That’s what we’re going to have to do in order to stay competitive with the national market. 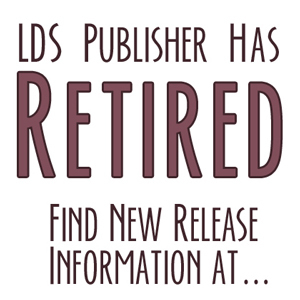 Now, to you readers – there are scads of good LDS books out there. We now have authors that compare with nearly every nationally bestselling author there is. If you’ve read an LDS novel and been totally disenchanted with the market because of it, please, give it another go. The bar is being raised. New authors are coming on to the scene all the time and the established ones are honing their talents like never before. It’s important that we support the LDS market as much as we can. The publishers need to see that there’s an interest in quality fiction – they are already putting most of their money into nonfiction because that’s what’s selling. Now, don’t get me wrong – there’s nothing bad about nonfiction. But if we want to keep seeing LDS fiction published, thereby making a way for talented authors to continue to make it to the shelves, we’ve got to get out there and show the bookstores what we think. Buy LDS fiction. Talk to your friends about it. If you find an author you really like, pass the word along. We can build this up to where the funds are present and the motivation is flowing. LDS fiction is still relatively new, and every new endeavor needs time to grow and develop. I think it’s starting to come into its own, and I’m excited to see it happen and to be a part of it. Well said–I’ve read tooooo many poorly done LDS novels and it makes me crazy, but I”ve definitely seen improvement over the last few years. Boy, I couldn’t agree more. I’ve read some horrible LDS fiction, by some pretty horrible LDS writers (I hesitate to call them authors). Once I made the mistake of purchasing a book by a self-published author because he was doing a signing at Deseret Book. His Christmas story was horrible. My wife and I plowed through it, but only because she insisted we do so because we had paid money for it (I know that probably doesn’t make much sense). On the other hand, I’ve seen some wonderful LDS fiction. Works by Dean Hughes, Chris Taylor, Gerald Lund, and many others (sorry I haven’t read yours yet, Tristi, but I’m planning on it). These people take pride in their craft and have written gripping stories that could appeal to the non-LDS market if they didn’t have “Mormon” written all over them. Personally, I prefer not to write to the LDS market. It’s too limited to make it pay. That’s why most successful LDS authors write series novels so they can make up the difference in income by selling more different books, rather than more of the same book. That’s a lot of extra work in my mind. It’s tough enough to write one good book, let alone a series of them. Still, I’m hoping for more quality LDS fiction. I love it when it’s done well. I couldn’t agree with you more. Thanks for your comments! Thanks for your “offensive” comments, Tristi! They are very much needed.